ArabSaga: Lavrov in Damascus: Aye or Nay? 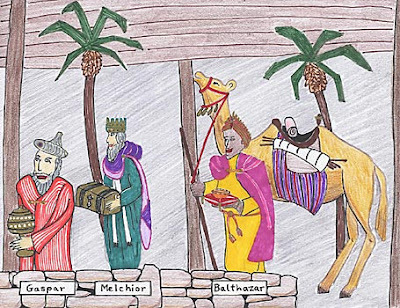 According to Christian tradition, three Wise Men from the East (named Balthazar, Caspar and Melchior) traveled to the manger where infant Jesus lay bearing ceremonial gifts of gold, frankincense and myrrh. Today, two senior officials from Russia – Foreign Minister Sergei Lavrov and spymaster Mikhail Fradkov -- travelled to Damascus bearing “three gifts” to President Bashar al-Assad, according to a leading Lebanese political analyst. “No to foreign military intervention in Syria. “No to Assad standing down. Russia can do no more for Syria; international pressure is mounting and so is the death toll. Take advantage of the offer on the table: change the regime’s chain of command instead of the regime itself; stay on the sidelines after naming someone to agree serious and swift reforms with the opposition; then implement them pending new elections allowing voters to choose between the regime and its opponents. Moscow would host the dialogue conference and ensure your personal and family safety and immunity from future prosecution. The alternative is a multinational siege of Syria and the outbreak of civil war. Lebanon’s famed pan-Arab political analyst Khairallah Khairallah, writing today for the first Arabic-language online newspaper Elaph, wonders how the “Russian sickman” can possibly treat his Syrian counterpart. It translates into: A bird pays a surety bond for a beetle; problem is both are winged.